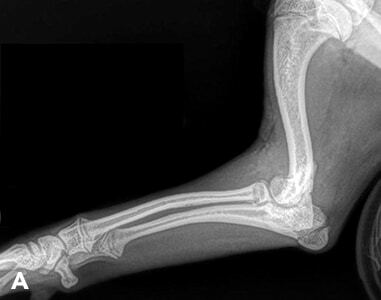 Fractures occur commonly in both dogs and cats. 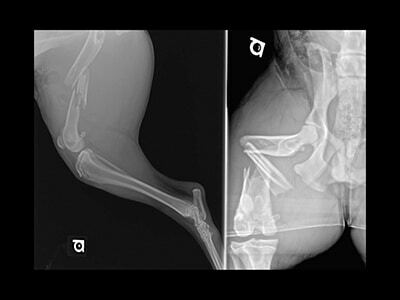 While typically fractures occur after a traumatic incident, such as being hit by a car or falling from a height, some fractures occur following a pathologic weakening of the bone, which is seen with certain neoplastic conditions, such as osteosarcoma. Address complications, if they occur. In Part 1 of this 2-part series, fracture biomechanics, fracture classification and diagnosis, and factors to consider when selecting a fixation technique are discussed. In Part 2, selection of fixation technique and specific techniques, identification of bone healing, and potential complications will be addressed. Wolff’s law—a theory developed by German anatomist and surgeon Julius Wolff—states that bone in a healthy person or animal will adapt to the loads under which it is placed or, more simply, bone adapts to pressure, or a lack of it. Bone is an amazing tissue with complex properties that allow it to adapt to its environment but typically conserve its general structure and shape. By following Wolff’s law, bone adapts and changes in areas of high stress, while minimizing changes in areas of low stress. Basically, bone is shaped for the greatest strength while, at the same time, minimizing bone mass that would contribute to increased weight of the animal. The anisotropic nature of bone suggests that bone strength is dependent on the direction in which it is loaded. For example, bone is stronger when loaded longitudinally versus transversely, which explains why bone is more likely to fracture with sudden high impact placed transversely upon the bone. 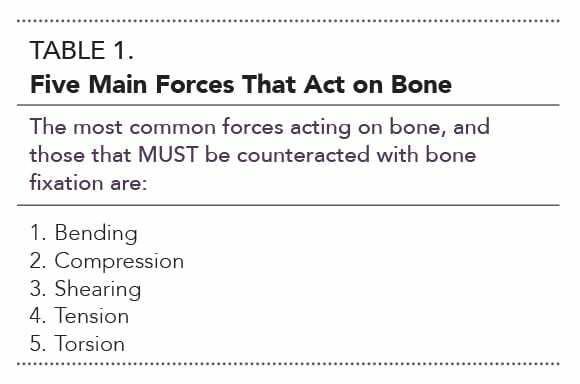 Bone is subject to many forces; a fracture occurs when the sum of these forces exceeds the ultimate strength of the bone. Therefore, understanding the forces placed upon bone is crucial to counteracting these forces when stabilizing a fracture. 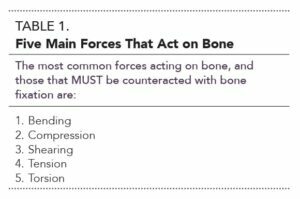 The 5 main forces that act on bone are listed in Table 1. Tensile (tension) forces act to lengthen the bone, while compressive forces shorten the bone. Shearing forces are typically parallel or tangential to the bone, while torsional forces act to twist bone about its long axis. Bending forces create a convex side of the bone (bone loaded in tension on the convex side) and a concave side (bone loaded in compression on the concave side). Bending forces are typically referred to as moments. Check and stabilize vitals (temperature, pulse quality and heart rate, respiration rate, blood pressure, pulse oximetry), if needed. Perform thorough physical, orthopedic, and neurologic examinations. Pursue initial diagnostics, including blood analysis, thoracic and abdominal radiographs, and an AFAST ultrasound. Resolve any life-threatening issues, which means that surgery may need to be delayed for several days due to conditions, such as pulmonary contusions or hypovolemia. Fentanyl: Dogs/cats, 2 mcg/kg loading dose followed by 2 to 10 mcg/kg/H CRI (caution with cats). Other opioids, such as butorphanol, do not typically provide adequate analgesia. Bone is stronger when loaded rapidly versus slowly, and when loaded longitudinally versus transversely. Therefore, bone is stiffer and stronger when loaded rapidly and longitudinally. Obtain a thorough history: It is important to separate traumatic from pathologic fractures by determining the cause of the fracture, such as hit by car or fall from a height. 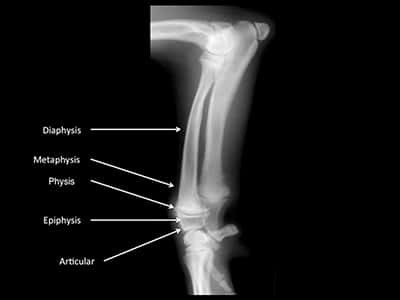 Evaluate physical examination findings: Signs of fractures include pain, swelling, reluctance to bear weight, crepitus, and/or angulation deformities. Sciatic nerve damage—seen with ilial fractures. Radiographs are the mainstay for determining fracture type and location. Key radiographic projections are orthogonal views, including lateral, craniocaudal, and oblique (if needed) views. If only a lateral view is taken, some fractures, such as T-Y humeral fractures that involve both the articular surface of the distal humeral condyle and the supracondylar region, will be missed (Figure 1). FIGURE 1. 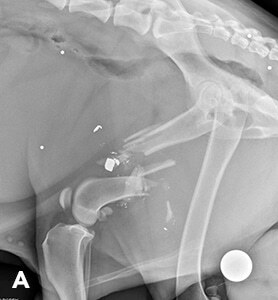 Lateral radiograph of the antebrachium in a young dog presenting for right forelimb lameness; this radiograph does not reveal any evidence of fracture or pathology (A). Craniocaudal radiograph of the same right forelimb, revealing a Salter Harris IV fracture of the distal humeral condyle (B). 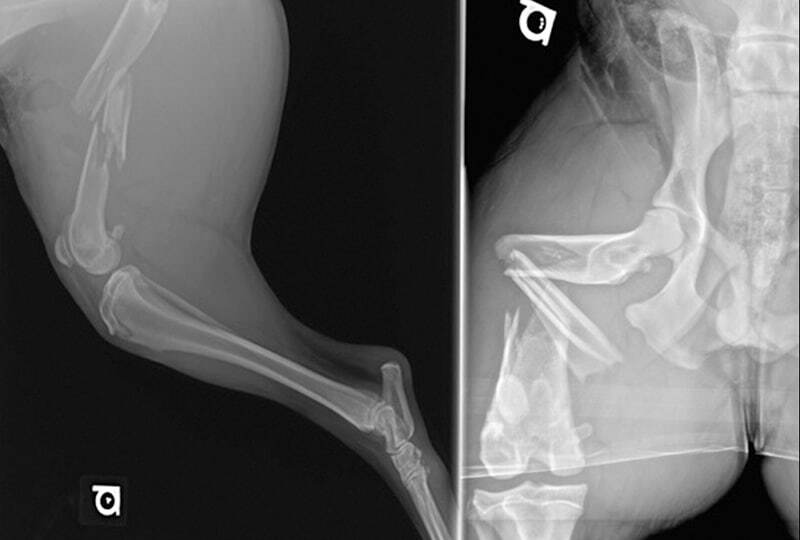 To improve communication between veterinarians and clients, and between veterinarians themselves, fractures must be correctly identified and classified. Fractures are initially classified by anatomic location, such as articular, physeal, epiphyseal, metaphyseal, or diaphyseal (Figure 2). 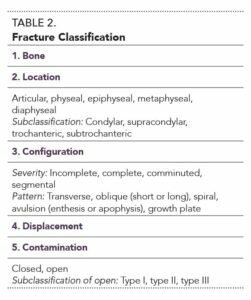 Certain fractures are further subclassified based on anatomic locations, such as condylar, supracondylar, trochanteric, or subtrochanteric. Segmental: Two or more separate fractures. The term compound fracture is no longer used for fracture classification. 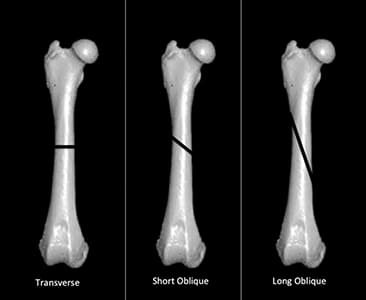 Long oblique: Fracture is > 2× the diameter of the bone (Figure 4). Growth plate: See Salter Harris Fractures. FIGURE 2. Anatomic classification of long bones helps describe fracture location. FIGURE 3. Lateral radiograph of mid-diaphyseal right comminuted femoral fracture due to trauma associated with a bullet (A). Craniocaudal radiograph of same femoral fracture (B). When both views are compared, caudoproximal and medial displacement can be seen. Note markers indicating right or left are not present; they were cropped out for magnification purposes, but should always be included in radiographs. FIGURE 4. Classification of transverse, short oblique, and long oblique fractures of a femur. FIGURE 5. 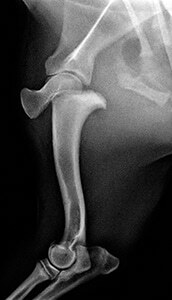 An olecranon fracture is an example of an apophysis fracture. 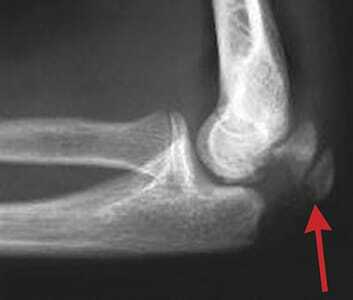 In this radiograph, the pull of the triceps is causing proximal displacement of the fracture fragment (arrow). Fixation for this fracture would involve counteracting the force of the triceps, such as a tension band fixation. Displacement should also be recognized when classifying fractures; full orthogonal radiographs are needed to fully characterize displacement. This property is based on the degree of displacement of the distal segment in relation to the proximal segment. An example is caudoproximal displacement, which is seen with most distal diaphyseal femoral fractures. Type IIIc: Compromised vascular supply to the skin. 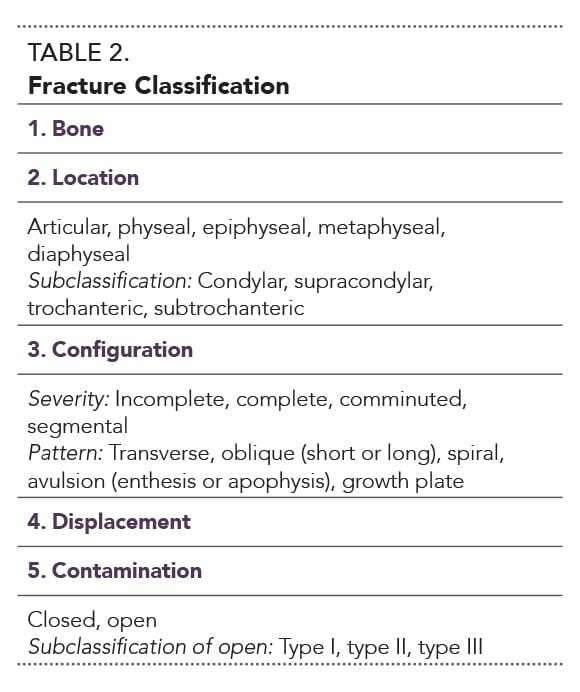 In summary, fracture classification provides an accurate description that is important when determining fixation approach (Table 2). For example, the fracture in Figure 7 is classified as a right closed mid-diaphyseal comminuted femoral fracture; there are multiple pieces but, in general, caudoproximal and medial displacement are present. SH VI fracture: Compression fracture through only a portion of the physis that typically results in angulation deformities after maturity. FIGURE 6. Salter Harris I fracture of the proximal right humeral growth plate. FIGURE 7. Example of a right closed mid-diaphyseal comminuted femoral fracture, with caudoproximal and medial displacement. This fracture is considered comminuted because there is only one fracture location with more than 2 pieces. If there were 2 fractures in the bone—both proximally and distally (ie, more than one fracture in the bone)—then it would be considered segmental. 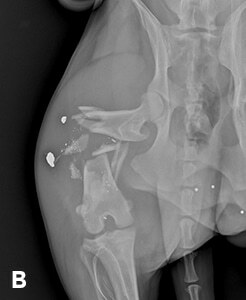 Veterinarian factors: Understanding of biomechanics and healing, knowledge of particular implants, implant availability. The goal is to select the appropriate fixation method for each individual fracture based on these described factors. For example, even though an intramedullary pin set and cerclage wires are available, this does not mean that every fracture should receive this fixation. In addition, when we approach fixation selection, we always evaluate the list of fixation methods (Table 3), pros and cons of each method, and previously described factors. In addition, we determine whether all the opposing forces (Table 1) can be counteracted with a particular fixation method. An important concern when addressing fractures is to understand when to refer the patient to an orthopedic surgeon, based on consideration of the type of fracture, patient comorbidities, availability of appropriate fixation techniques, client resources, and the practitioner’s experience. Cross AR. Chapter 41: Fracture biology and biomechanics. In Tobias KM, Johnston SA (eds): Veterinary Surgery: Small Animal, 1st ed. Philadelphia: Elsevier, 2012. Meredith Kapler, DVM, is a small animal surgical resident at North Carolina State University. She has presented at the Veterinary Orthopedic Society Conference, instructs veterinary students, and contributed to research articles and a book chapter. She received her DVM from University of Tennessee, completed a small animal internship at Virginia–Maryland Regional College of Veterinary Medicine, and completed an orthopedic research fellowship at University of Tennessee. Upon completing her residency, she will work as a staff surgeon at Veterinary Specialty Hospital of the Carolinas.